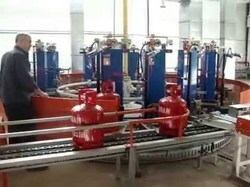 We can supply complete LPG Cylinders Manufacturing plant with know how, training the man power, testing machines on turnkey basis. Our firm is proficient to provideLPG Gas bank in various forms. Our provided products are extremely used in the market owing to their top features. - Platform Size: 500 mm Sq, 610 mm sq, 750 mm Sq, 1250mm Sq. - Pnuematic arrangement, lifting table, conveyor, filling gun etc are not included.